The last time I was at 185 Hope Street, it was known as ‘Candy Bar’ and was serving up tapas food and a wide range of cocktails. At the time I left Candy Bar not overly impressed and in no rush to return. 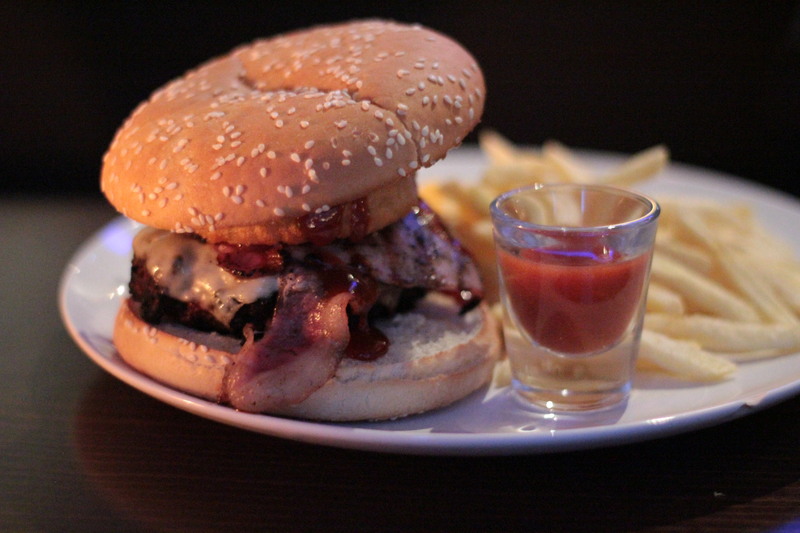 Fast forward a little over two years later to today and I had no idea that it had even closed down, until one of our readers got in touch to let us know that there was a new bar on Hope Street by the name of ‘NYC’, offering up a range of new burgers. Upon checking further, I realised that it was infact located at 185 Hope Street. Hoping that it would be better than it’s previous occupant, we decided to check it out. When we walked into NYC, the first thing that we noticed was that the layout was still much the same as ‘Candy Bar’ but with New York City paintings and canvases hanging from every wall. The bar also had a very cool American flag painted on top of it. Despite these cool touches, it didn’t make me think of New York or make me feel like I’d been transported to New York. All I could think of was the ‘Candy bar’ that was here previously but with a few New York City themed pictured on the walls. Strangely, there weren’t a whole lot of tables, but luckily we managed to grab one by the window. 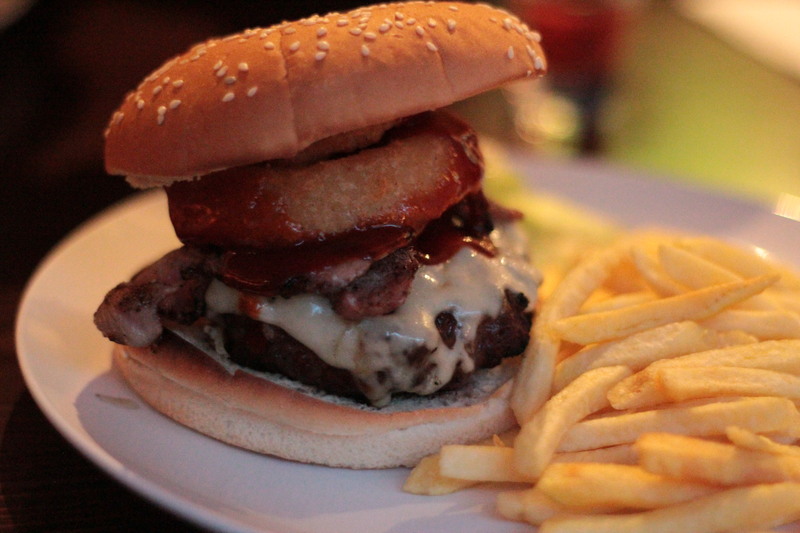 We had a quick look at the menu and decided to go for the Manhattan burger – a beef patty topped with onion rings, steaky bacon, emmental cheese and BBQ sauce on a toasted seeded bun. While we waited, I had a quick look at the beer selection. From our table, I spotted Blue Moon, Brooklyn Lager, Sam Adams, Budweiser and Heineken all on tap and with Blue Moon and Sam Adams being two of my favourite beers, the selection here gets a big thumbs up from us. 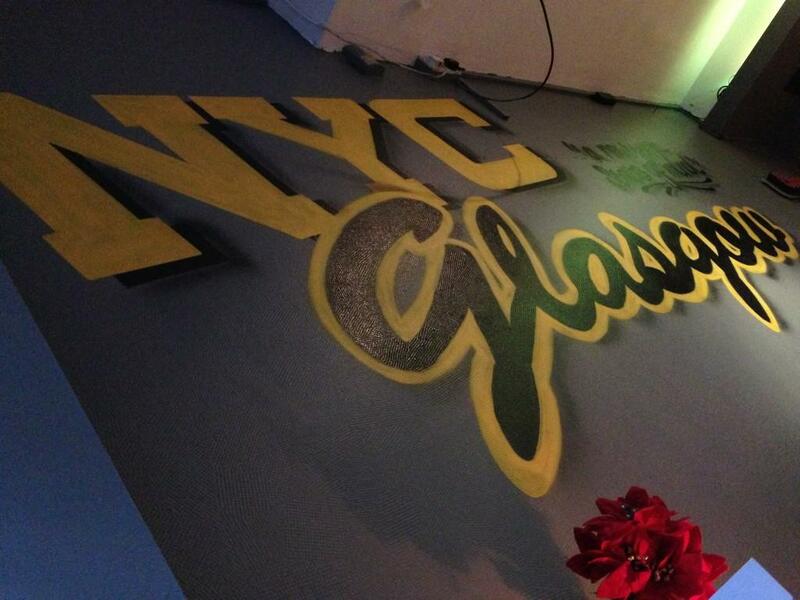 They also offer a wide range of cocktails and the bar does seem like it would be a fairly popular pre-club hangout, with it being located so close to the likes of Bath street and Sauchiehall street. Our burgers arrived and my initial thoughts were that, presentation wise, they reminded me a lot of the burgers we had at Kuta on Bath street. Hopefully they would at least taste a little bit better! The bun was fairly standard and nothing special, but was lightly toasted and held everything together well, although it was considerably wider than the patty itself. The cheese was nicely melted and the patty was a good size. Unfortunately, that is where the positives ended. In terms of taste, the Manhattan was quite forgettable. The patty was fairly bland, not very well seasoned and tasted quite gristly. It was also overcooked and hard on the outside. Tapping my knife against it sounded like I was tapping on a solid object and not a piece of cooked meat. I understand that it is supposed to be chargrilled, but unfortunately this wasn’t. The Manhattan just didn’t taste like a high quality burger and for £8.95, I’d expect more, considering what you can get nearby for a similar or lower price. 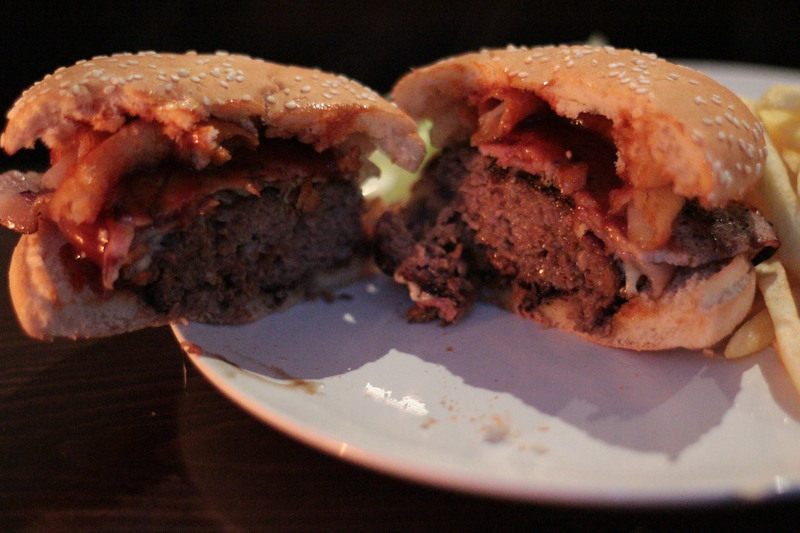 The BBQ sauce and the cheese provided a nice, smokey flavour, but I didn’t feel that the bacon and onion rings added anything to the overall taste and were just there to make the burger bigger. 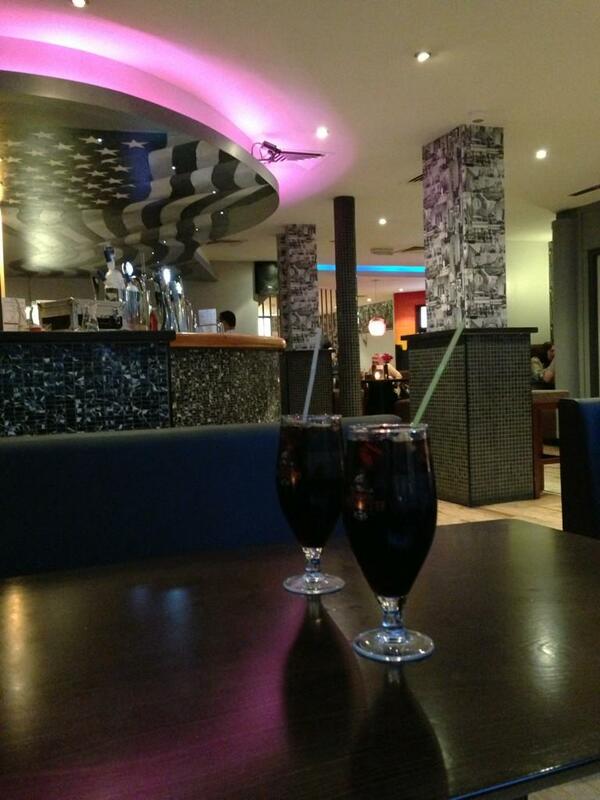 For two burgers with fries and a soft drink each, our total was £23.90. For the price, there are simply far better quality alternatives available elsewhere. The Manhattan certainly wasn’t the worst burger I’ve ever had, but it left me feeling rather cold and in no rush to make a return visit, despite the extremely friendly service and excellent beer selection. + Great draught beer selection. – Overcooked – burger was burned and hard on the outside. – Quite pricey, considering what you can get for cheaper elsewhere. That’s not how you spell Manhattan. Woah, how did we miss that?! Thanks, amended! That’s what happens when you try and write reviews in the early hours of the morning on next to no sleep! Have you been back recently? I think they have changed the menu & upped their game since opening!